Hooray! Today marks the beginning of another CSA season, our fifth. 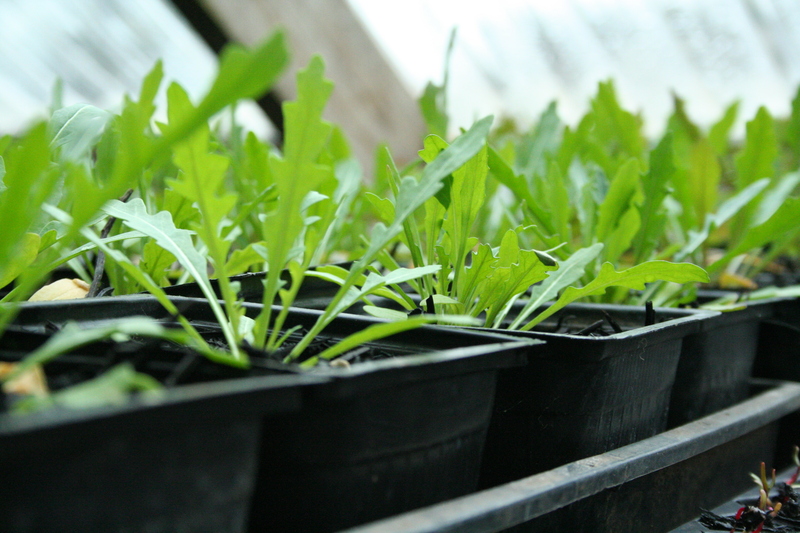 This week we have been thinking back to our first year, the beginnings of Growing Wild Farm. We were happy to realize that a third of our members are founding members, folks that have been part of this farm experience since the beginning. Another third have been with us for almost as long, joining in our second or third years, and about another third of you are just starting with us this year or joined sometime last year. For some of you, the start of another year is old hat and our history is part of your own history of eating with us. For our new members, though, we realized that some of our story may be unfamiliar, so we thought we would briefly share it today. So, how did Growing Wild Farm begin? The seeds of our farm started to germinate within the first year of our marriage. We, admittedly, married and started our family while relatively young by today’s standards. The farmer was just 23 (I was 25) and up to that point we were still pursuing other interests. When we met, one of us was going to be starting a graduate program in literature and philosophy , the other was focused on making music. We really didn’t have the kind of clear ideas about how we were going to make a living that many people do. We were both idealists and at that point, we were happy to be doing what we loved and money was not a concern. But together, we quickly realized that we wanted to start a family. Long story short, after starting a family and beginning to grow our own food and becoming friends with someone who had spent time working on a CSA farm out here in the Pacific Northwest, we decided that this was the work for us. It would fulfill both our need to make a living to support our family, as well as our own personal need to do work that we loved and that held significance to us, all while keeping us together as a family. Having been introduced to Wendell Berry in college, the idea of local foodsheds had always stuck with me, and I had always imagined living in the country in a self-sustaining kind of way. Once we began gardening, the farmer quickly found that he loved growing food, building soil naturally, and creating diverse and alive spaces where our crops flourished as well as provided a balanced ecosystem for wild things as well. We read gardening books and permaculture books and some that pertained to commercial growing, moved here to Oregon, and began looking for land. In many ways, we were so naive! We had started our married life in Colorado were we knew we could never afford land, spent time in my home state of Nebraska where land was very reasonable, then moved here knowing that land was not too over-inflated, but it was still high close in to the community we had found in McMinnville. So while we looked at properties closer to Sheridan and Grand Ronde, much farther away than we wanted, Grandma and Grandpa asked us how we would feel about buying something together. There were many things to consider, especially since Oregon’s land use laws make it hard for you to have two residences on a piece of land with only one pre-existing home. In the end, we decided we could figure this part of it out down the road since they would be staying in California for a few more years, and we all agreed it was a good idea. Time was of the essence since they were selling a home to re-invest in the farm. I was nearly due with our third child. They came up for a week or so and there was a whirlwind of looking at properties and deciding on one that week! It was not the long and drawn out search for our “perfect” property by any means, but it was going to be such a benefit to us all, and we would have some land to start our farm, so we were excited! So that year we closed on the property on my little girl’s due date, she was born a week later, and we moved in when she was two months old. The farmer started transforming this place even before we moved, planting our first orchard as soon as the farm was ours, coming out to water them while we coddled our new little baby at our home in town. The rest of that year we walked the property, drew out a map of what we thought the whole place might look like one day (and we are always surprised, when we pull this out, how things are coming together so much like this first plan! ), and we started to envision our business. Again, we were naive in so many ways! We knew we wanted to be a CSA farm primarily, while doing our one (at that time) local farmer’s market, as well as selling a little to restaurants. This model has still proven to be the best fit for us and for a sustainable farm business. However, not having grown food on such a large scale for production before, just having grown a home garden and selling some of that abundance at a very small Nebraska farmer’s market, we were not fully prepared to begin offering a CSA that first year….we just didn’t know that until after we were knee deep in our first season. It was very hard and frustrating and, quite honestly, humiliating. We took our permaculture growing method of sheet mulching and tried to apply it to our larger growing space on soil that was heavy, heavy, heavy clay, sold 50 CSA shares, and got really excited to be living out our dream. That year, getting vegetables to grow in that soil was like trying to pull teeth that weren’t loose. It hurt. We kept our chins up, and worked really hard to meet our obligation to our CSA members. We bought organic fruit from other farms to round things out. By the end of the year we were exhausted and relieved to be done for the year. We even ended farmer’s market two weeks early. The farmer went back to work landscaping for the winter and we re-thought everything. The truth was we didn’t want to do anything else at all. We knew this was the work we were meant to do, we loved it and the life of living on the farm. WE BELIEVED IN IT. We knew that nourishing our community and the land we were stewards of mattered. And so, despite that first year, we went forward. We rearranged our farm model slightly, slowly building back up to this year, where we are right back to the plan we started with. We have transformed our soil and are now growing on more land, all of it in good health. Around our third season, we joked that we had completed our two year internship and that we were starting our business in earnest. Now, in our 5th year we are happy to have a thriving CSA, two markets to attend with one year round, and some great local restaurants who like to buy our produce when we have it. The farmer has even been able to retire from landscaping and is now a full time farmer! We have had many growing pains along the way, but that comes with any kind of good learning. We have been stretched and molded by the work we have done. We have grown as our farm has grown, and found a home not only on our farm, but through our farm, in our community. So, hooray! Today marks the beginning of another season of eating together. This year, you will share with us the delicious flavors of each season, of food that tastes unlike anything you can find in the store, full of life and nutrition. We will welcome you to the farm, we will celebrate together this summer. Each week, we will see each other and share small news with each other, all while communing together over the gifts of the earth, the beautiful produce grown on this farm.